Spray 4- to 5-quart slow cooker with cooking spray. Place onion in slow cooker. In small bowl, mix dried minced garlic, cumin, pepper, salt and 2 tablespoons of the lime juice to form paste. Pat mixture on top and sides of pork roast (if roast comes tied or in netting, remove before rubbing with spice mixture). Place roast on onion. Top with chiles. Pour enchilada sauce around roast. Cover; cook on Low heat setting 9 to 10 hours or until meat is tender. Remove pork; when cool enough to handle, shred with 2 forks. Return meat to slow cooker; stir in cilantro and remaining 2 tablespoons lime juice. Heat tortillas as directed on package. 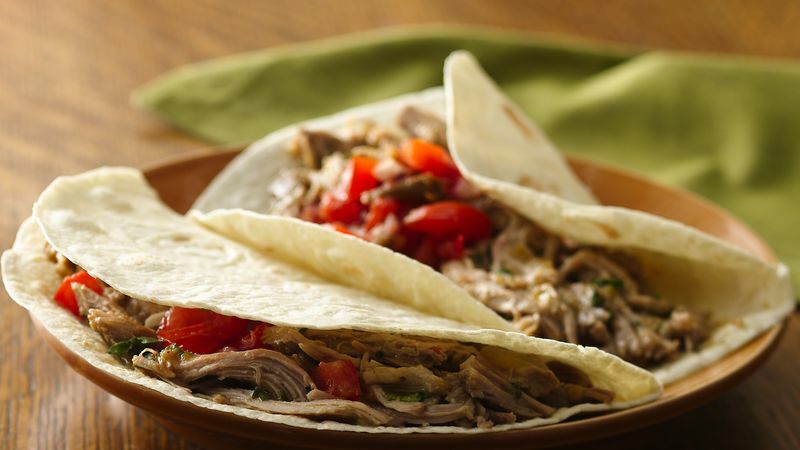 With slotted spoon, spoon 2/3 cup pork mixture on each tortilla. Serve with salsa. If you have leftover pork mixture, freeze it. Spoon into freezer containers or freezer plastic bags; seal and freeze up to 6 months. Thaw overnight in the refrigerator. To reheat, pour contents into a microwavable bowl. Cover; microwave until thoroughly heated. If your slow cooker has a removable stoneware bowl, assemble the recipe the night before, then cover and refrigerate. The next morning, just place the filled bowl in the slow cooker base and turn on the heat. Or, slice the onion, juice the lime and place in the refrigerator. Set out the canned goods and measure the spices, then in the morning, you’ll be able to fill the slow cooker in just 5 minutes. Either way, dinner will be waiting for you after a busy day.